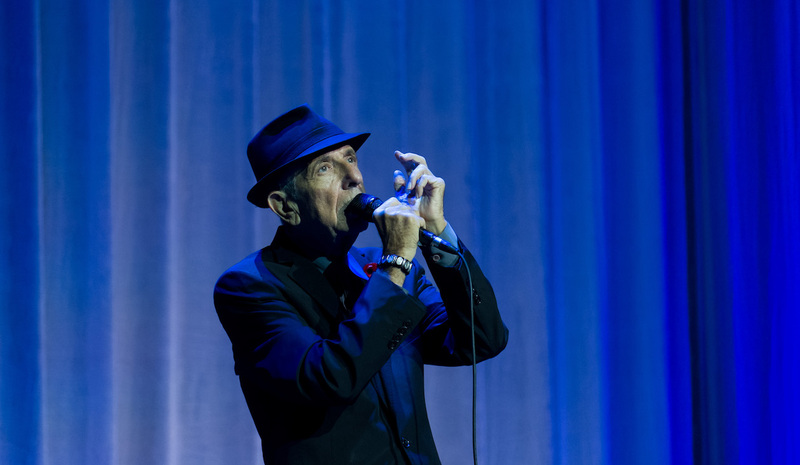 Montrealers didn’t paint the town red in memory of Leonard Cohen, but in early November, on the first anniversary of his death, they came close to dressing up the whole city in black and white. At Pierre Elliott Trudeau International Airport, the image of a fedora rose up above the letter O in the city’s metallic name on the terminal building. On Crescent Street in the alcohol-fuelled heart of downtown, a tall grey-scale mural was unveiled on a nondescript apartment block, with a courtly-looking Cohen placing his right hand across his heart. (On Saint-Laurent Boulevard, closer to the singer’s Montreal home, a different Cohen mural had gone up in the summer.) A few of the singer’s words were illuminated in giant white capitals on a silo in the Old Port. There was even a quasi-official karaoke event in the Place-des-Arts metro station. 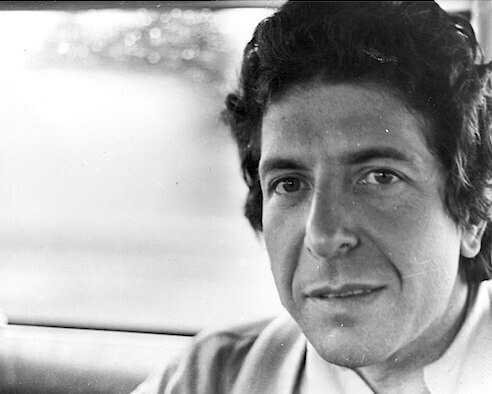 If not all of the participants were blessed with the gift of a golden voice, well, neither was Leonard Cohen. But perhaps the most challenging and substantial work in the show is by the American artist Michael Rakowitz—and what makes it stand out is that while Rakowitz is indeed a fan of Cohen, but an angst-ridden, tormented one. Rakowitz is an anti-Zionist Jew, angered by the suffering inflicted on Palestinians, and in a film and archival display entitled “I’m Good at Love, I’m Good at Hate, It’s In Between I Freeze,” he confronts Cohen’s eager participation in Israel’s Yom Kippur War of 1973 “as a kind of warrior poet.” The archival installation includes a stone that Rakowitz took from near the grave of the great Palestinian poet Mahmoud Darwish—now placed on top of a chunk of bedrock from Cohen’s childhood home in Westmount. While the singer’s disembodied voice now echoes throughout the MAC—the show could have been called “Songs From Several Rooms”—another standout piece puts the human body front and centre. “When Even The,” created by the Montreal actor and choreographer Clara Furey, juxtaposes a lead sculpture of a human corpse (the sculptor is the tough-minded British artist Marc Quinn) with a transgressive dance by Furey herself. Her inspiration, and the title of the piece, was a Cohen poem in which, unusually, the poet’s familiar irony and two-mindedness extends to the very syntax. “This work explores the sensuality of death,” Furey says. “And also life. It’s an attempt to be in conversation with Cohen’s Zen practice.” As a homage, her work is both original and provocative. Several of the films and installations aim to recreate Cohen’s presence: a vivid but ultimately futile gesture, popular though it will be at the MAC over the next five months. It’s the Sanchez Brothers, a pair of young Montreal artists, who succeed best at evoking the man’s absence. In their haunting installation “I Think I Will Follow You Very Soon,” they recreate a room in the singer’s Los Angeles home. A guitar case lies on the floor near an empty chair. A keyboard, a bench, a single lit lamp: everything appears normal. All that’s missing is the owner of these objects. Through a window at the end of the room, you can see a holograph of cars moving, night falling, and a fedora-clad man, his back to the viewer, sitting and gazing at the passing scene. Stand and watch long enough, and the holograph of Cohen will turn to face you. It’s a startling experience. 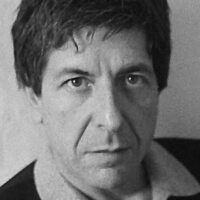 In 2003, before his decades of depression finally lifted, Cohen made a series of casual, impromptu self-portraits. Step into another of the exhibition’s small rooms, and you’ll find some of these self-portraits projected onto a pale wall. “What’s fascinating about them,” Zeppetelli suggests, “are the annotations.” A few of them are poems, others a mere notation of place and date. To me the most poignant—alongside a drawing of the artist’s aging face, full of bleak surprise—reads: “For a second or two, I forgot who I was.” Then memory returned.